Here’s how to boost kids’ comprehension. Check out these classroom-perfected success secrets. A big help for Back-To- School gear up! These strategies work with Non-fiction/infotext, a big focus in Common Core. Most kids K-8 benefit from many of my favorite activities. As easy as A B C D E! #Let’s Plain Talk, Together! What really matters to help kids understand what they read? Start by connecting to the prior lesson, as a quick review. Find out what your child or students already know. This is called schema, or schemata (prior knowledge). SET the lesson or mini-lesson. This is the transition from the previous lesson and opens or hooks what you are teaching. Grabbers! Make sure your child knows why it’s important to learn and master the topic. 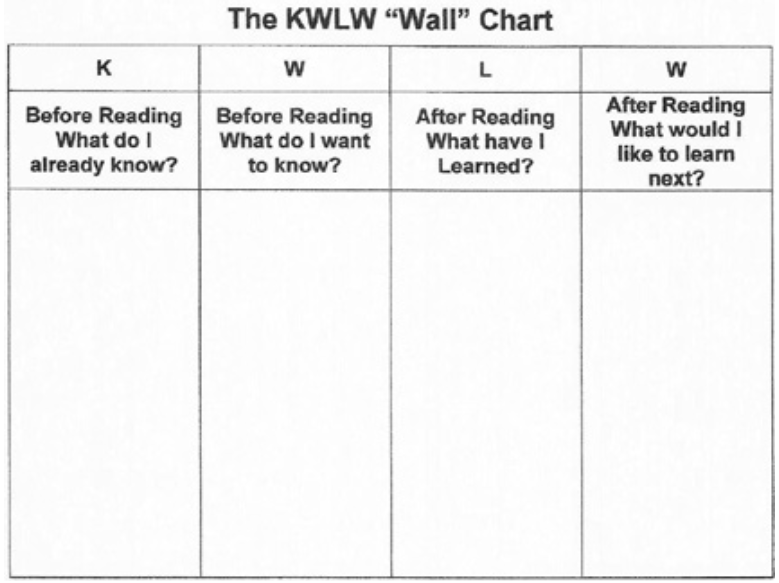 Use the original KWL CHART (Donna Ogle) or my revised chart. I also make one with an extra column W at the end for Where will I find it? Finding out what kids already know. There are other variations to the basic KWL strategy. Use whatever works best for you! Do a ‘Walk Through’, checking out the book or chapter. Make predictions about the selection. List any new vocabulary words. Organize the chapter titles and main headings. Write/ask questions what you want to learn. Adjust rate or speed to match the reading level. Take notes, as Sketch Notes or whatever you like to do. Summarize as you go- chapter, paragraph or line. Answer questions you started with. Reread any sections you need to. Do retellings. Find main ideas and details, look for topic sentences. Answer your questions after reading to see if your predictions were right. Sequence the reading selection, regarding importance and serial order. Summarize your reading, out loud and in writing. Look for any clarifications and inferences in the material. Use the new vocabulary routinely and correctly spell new words. Use QAR’s: (Raphael). When responding to questions, it’s Literal– Right there; Interpretive– Look for it; and Inferences– Use prior knowledge to guess. Do PWR: Predict what the chapter, paragraph or page is about. Predict. Write. Read. Do RCRC: Read it. Cover or close the book. Recite what you read. Check. Open the book or selection to see if you’re right. Knowledge: State the basic facts. Name, list, tell, define, describe. Comprehension: Understand the concept. Discuss, summarize, explain, demonstrate, review. Application: Use the information. Show, apply, produce, draw, select. Analysis: Check the parts. Compare, contrast, debate, classify, diagram. Synthesis: Put the information together. Design, create, construct, perform, organize. Evaluation: Form an opinion. Decide, conclude, rank, rate, prove. Boost comprehension by having your own blueprint or roadmap to success! I hope these strategies are helpful as you fill your Back-To-School toolkit with ready- to- go ideas. I’m here to answer your questions. I’d love to hear from you! Be sure to check out my FB page and I’m on Twitter @RitaWirtz. #Let’s Plain Talk, Together.